Plaster casts of the jaws, clinical photos, one panoramic and one lateral X-ray image are traditionally taken before starting an orthodontic treatment. 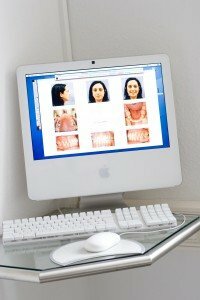 For us, the most important documents are at least eight before and after pictures of the patients. These include usually three portraits and five pictures of the mouth that are taken with a high-resolution digital camera. The intraoral shots give more information than the plaster models, showing inflammation, decalcification of the teeth, deficient fillings, and often also dysfunction of the tongue. Therefore they are very important for both treatment planning and patient consulting. At the end, we always show the patients the pictures taken before and after their treatment for comparison: there is nothing else that could show the success more clearly. 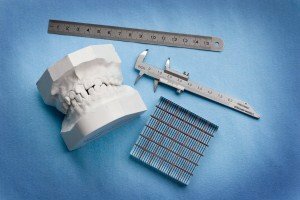 Dental impressions and plaster models of the teeth and jaw are still standards. This old technique is a little cumbersome for the patients and the thousands of models in the office need much space. In the long run the old dental impression technique may be replaced by digital impressions that are taken with an optical device or, alternatively, with a three dimensional x-ray machine (cone-beam tomogramme or CBT). Both techniques are not widely accepted yet, but we are following the development closely. 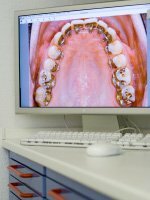 In order to diagnose caries, missing teeth, inflammation within the bone and other surprises before the treatment, a panoramic x-ray is essential. Usually, a second panoramic x-ray is taken during the treatment to check on the inclination of the tooth roots. Today, we normally forgo the lateral x-ray for science-based reasons. The lateral x-ray brought a lot of scientific findings without which modern orthodontics would be unimaginable. But as its contribution to routine treatments is negligently small we can abandon it without a decrease in quality. Like this, we spare our patients unnecessary radiation exposure. Only reviewers who stick to traditional, but outdated standards sometimes act up as they think this kind of x-ray would be indispensable. The photographs and X-ray images are saved on the office server and can be consulted and edited at every work station. On the screen, we can superimpose x-rays and lateral portraits. They can be edited within seconds in order to simulate different treatment options. The world’s leading orthodontic software Quick Ceph, which was developed by a German orthodontist who works in the USA, allows us to edit and save images. It is important for us to avoid excessive diagnostics without sense and use: there is practically no so called articulator mounting of jaw models anymore since they do not add any value but high costs to the treatment. 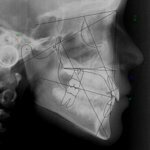 Furthermore, we forgo making magnetic resonance tomography of the jaw joints for respectable reasons because they are mainly an expensive nonsense without any use for the patients.